Gorgeous in green. Richly hued pear-cut emeralds (3/4 ct. t.w.) are enhanced by glittering round-cut diamonds (1/10 ct. t.w.) 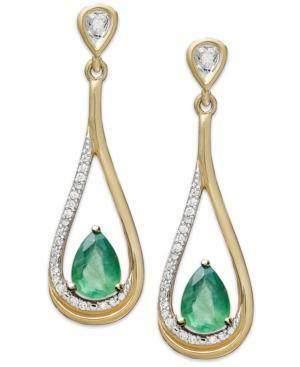 in these stunning pear-shaped drop earrings. Crafted in 14k gold. Approximate drop: 1-1/8 inches.